Actor,Salman Khan has launched a website for his fans and the media to let everyone know the exact details of the legal cases pending against him. A website, www.salmankhanfiles.com is being regularly updated by his group of legal experts, who are serving as an interface between the star and his fans. Bade bade log…badi badi baaten…..how the celebs encash on their misfortunes as well….things to learn from….is this the way to mould public opinion? Great presentation with your cartoon. Perfect forum for felons of all hues. Во всяком случае, я держу с Indiblogger! hahahaha 😀 true words !! 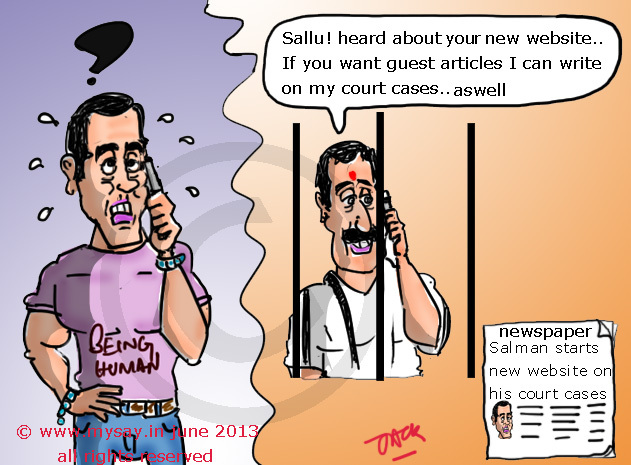 Haha @ guest posts from other criminals…maybe Sanjay Dutt will contribute too !! ROFL….Guest posts?????!!!!!!!!!! Still can’t stop laughing!!!!! !